Students with a valid high school ID are invited to audition for this summer’s comedy production to be presented at Cutting Hall Performing Arts Center in July. 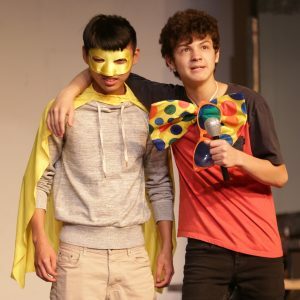 Palatine Park District’s High School Comedy Playhouse will hold auditions for “The Complete History of America (Abridged)” on Wednesday, May 31 from 6:00pm until 9:00pm at Community Center, 250 E. Wood Street, in Palatine. Incoming freshman and recent graduates are also welcome. From Washington to Watergate, from the Bering Straits to Baghdad, from New World to New World Order, “The Complete History of America (Abridged)” is a 90 minute roller coaster ride through the glorious quagmire that is American History. The players will take the audience through over 300 years of history as they mine dozens of landmark events and trends in record time leading to present day. To set up an audition, participants must complete an online audition application. Students are expected to prepare a one minute monologue from a published play or tell a funny story. It is recommended that monologues be memorized, but it is not required. Participants will then be paired up to read scenes from the script. Students participating in the audition will be asked to provide a list of any and all conflicts they have during the months of June and July. Rehearsal schedule will be determined by cast conflicts. Participation in the audition does not guarantee student will be cast in the production. The production will open July 14 and run through July 23 with 7:00pm performances on Fridays and Saturdays, and 3:30pm performances on Sundays. For more information about the High School Comedy Playhouse program, contact Cultural Arts Coordinator Ashley Schiavone at aschiavone@palatineparks.org or 847.496.6237.